The coffee plant originated in the hills of what is now Ethiopia where it still grows wild to this day. Despite this, Yemen was the first country to cultivate coffee. Shipped out of the port of Mocha (a major trading port of its day), coffee became a world trade good by the 15th century. By 1616, the Dutch had propagated the plant on their colony on Sri Lanka. In 1699, cuttings were also taken to the island of Java, another Dutch possession. Soon Europe was able to break the monopoly held by Yemen. The port Mocha beans along with the Java colony beans produced enough to bring the price down so a greater proportion of the population could enjoy coffee. It is from the blend of these two imports that the name "Mocha Java” was coined. In 1657, the first article was published about the exotic brew in the London Public Advertiser, saying: "In Bartholomew Lane on the back side of the old exchange, the drink called coffee, having many excellent virtues, fortifies the heat within, quickeneth the Spirits, make the heart lightsome and many others is to be sold in the morning and at three of the clock in the afternoon." The profitability of coffee as a trade good soon led others to produce the crop. In 1723, coffee was taken to the Americas and planted on the Island of Martinique and the French joined the race. 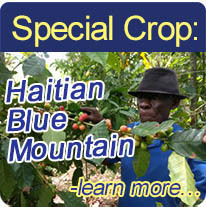 The French went on to plant coffee on Haiti and Tahiti. In 1750, Spaniards took coffee to Cuba, Puerto Rico and other West Indies locations. In this way, competitive capitalism, coffee has spread to this day when it is now the second most traded commodity in the world after oil. The coffee plant is a shrub that belongs to the family Rubiaceae and is of the genus Coffea. The two most significant species of the genus used for human consumption are Coffea arabica and Coffea canephora (commonly called Robusta). In its wild state, the plant grows to a height of 8-10 meters with rich green, glossy leaves. The flowers are white and grow in cluster of two or three. The plants of the Arabica species are autogamous, meaning the flowers pollinate themselves, while the robusta species needs to be cross-pollinated with neighboring plants. The fruit of the coffee tree, called the cherry, turns bright red when fully ripe. The outer layer of the cherry is a thick skin that encloses a layer of jelly-like pulp. Inside the pulp are usually two seeds called beans (occasionally a single bean, called a "peaberry," that is a result of insufficient pollination). The beans are encased by a thin, whitish skin called parchment. Inside the parchment, each individual bean is encased in another layer called the silver skin. Once the parchment is removed the beans are no longer able to germinate. The silver skin is left until roasting. 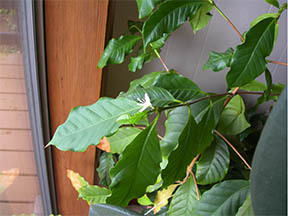 Arabica plants are particularly sensitive to the disease Hemeleia Vastatrix. This disease entirely destroyed the plantations of Ceylon, which later were replanted with tea and a small amount of the heartier Robusta variety. Hemeleia Vastatrix is only manageable at altitudes greater than 900 meters above sea level. This is why most Arabica plantations are grown at altitudes of 900-2000 meters. Coffee plants are also extremely susceptible to frost so the growing area for Arabica is limited to the tropics. Given the cost of cultivating plants at higher altitudes and in steep terrain, it is not surprising that Arabica coffee is a more expensive product. The heartier Robusta is cultivated in a wider range of latitudes and altitudes. Another marked difference between Arabica and Robusta is in the bean itself. From a chemical standpoint, an Arabica bean has 1-1.7% of the chemical known as caffeine, where Robusta beans contain 2-4.5%. Because caffeine is bitter to the human palate, Robusta beans are mush more sharp and bitter in the cup. Robusta beans also contain greater quantities of chlorogenic acid, a substance that can upset digestion if they exceed certain levels. Caffeine is the most well known component of coffee. It its pure form, caffeine is an odorless, bitter white powder that is soluble in water. Usually most of the caffeine present in coffee is dissolved in the brew. In espresso, however, less caffeine is dissolved because the water is in contact with the bean for a briefer period. Once the coffee beans are mature and ready for sale, there are classifications that buyers consider in making purchasing decisions. Coffee beans first go through an incremental sieve sorting process. Every country can adopt their own way of expressing these classifications, but generally beans are assigned AA, A, B, or C to indicate decreasing sizes of beans. Brazil uses numerical classifications of 13-20. Percentage of imperfect beans is also an important classification. This is usually expressed with the New York coffee and sugar exchange method: NY2 in this scale means there are 4 imperfect beans for every 300 grams, NY3 shows there are 12, and so on (imperfections include broken, rotten, bug-eaten or discolored beans). Yet another classification seen on some consumer bags is one used in Central America to show bean density: HB and SHB means hard bean and strictly hard bean. This usually also indicates the growing elevation; SHB is grown above an altitude of 1600 meters. Once the Beans are ready for export they must enter the market. Brokers will usually buy lots of coffee at auctions that are held regionally in growing areas. Farmers will bring their coffee to these auction houses and have them put up to bid. The brokers usually use the New York exchange price index as an indicator as this will help them realize a profit when they go to sell the beans to global importers. An alternative to this system is the “Fair Trade” system or the “Direct Trade” system. In the Direct Trade ideal, the roasting company will buy their coffee directly from a coffee plantation or co-op and negotiate a price that suits both parties. This system is preferable since the growing company has a say in the final price of their product. Fair Trade certification is a controlled form of direct trade where there is a third party auditing the transactions from producer to roaster to ensure they meet a regional standard in price that allows farmers a living wage. Other requirements in the Fair Trade system include the co-op setting aside a percentage of sales for community development and offering growers pre-harvest financing to expand crop lands or make transitions into more sustainable growing methods. By receiving a fair price for their product, growers can avoid cost-cutting practices that sacrifice quality. Eighty percent of Fair Trade certified coffee, tea and chocolate is also certified organic and shade grown. The practice of growing plants under natural shade canopy preserves crucial habitats for a diverse array of plants, animals, and migratory birds; crucial because forested lands are some of the world’s most threatened ecosystems. 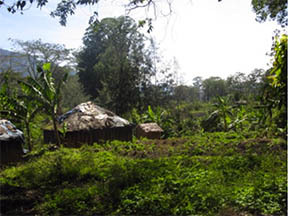 Shade grown coffee cultivation also increases water and soil conservation. After coffee is sold to individual roasters, green beans stored properly will keep for several years. Once roasted, however, the lifespan of coffee decreases dramatically. Therefore it is always best to have very freshly roasted beans to make the best possible cup of coffee. Support your local roasters! Coffee roasting is a process that brings coffee from room temperature to 425 – 490°F, depending on roast, and ideally within 10-15 minutes. The main physical change that occurs is loss of weight due to water evaporation and escaping gasses. The decrease in volume is accompanied by the structure of the bean becoming more brittle. The color changes from green to brown due to the caramelizing of sugars and other carbohydrates. Chlorogenic acids also drop with heat, usually from 7.4%-5% in Arabica beans. These are the acids usually associated with sour stomach. New substances also develop during roasting, including about 200 substances that compose coffee’s volatile aromas. These components are formed by Maillard’s reactions (named for the person who discovered them). Water vapor and other gasses expand with heat and cause the bean to swell up to a third more its size, creating popping sounds twice during the roast. The "first crack" is when the outer layer of the bean breaks. The "second crack" is when the interior kernel pops open. During these events, carbon dioxide and volatile aromatics are released, creating the characteristic smell of roasting coffee. This is also when the silver skin breaks off the bean and is pulled away by the cyclone of the roaster’s exhaust fan. Roasting also affects two key elements of taste: acidity and bitterness. Bitterness increases with roast due to progressive carbonization of carbohydrates, while acidity diminishes. The lighter the roast, the more acidity in the cup. In contrast, the darker the roast, the more bitter the brew. Finding the balance between these two in a given bean is the goal of roasting and blending. The roaster must determine the ideal moment to stop applying heat and to cool the beans as rapidly as possible, halting the chemical reactions. Once roasted, the beans rapidly lose their freshness. Left exposed to the air, carbon dioxide is slowly released from the beans. Oxygen then takes the place of the carbon dioxide, along with moisture, which accelerate the process of oxidation. The beans will remain fresh the longest when stored in sealed containers with a vacuum or an inert gas. Since the end product is a beverage, the result must show in the cup. Generally, 10grams of coffee are ground for infusion in 6oz of water at 200°F. The substances responsible for taste are those that are soluble in water while the substances responsible for the aroma are found in the oil. The oils are almost entirely insoluble, but when put in hot water they are released from the bean and float to the surface. The high pressure of the espresso process is the only way to get these oils partially emulsified in the water. This creates the reddish-tan crema you see on the surface of the espresso shot. Acidity(+): a pleasing sharpness of taste. Astringency(-): A feeling of dryness, puckering. Tannic. Caused by unripe beans. Bagged(-): an off flavor caused by beans overheating in an enclosure and steaming in their burlap bags. Body(+): the intensity of sensation on the tongue; "full bodied" is a heavier sensation in the mouth. Burnt(-): a smoky taste of carbon from over roasting. Musty(-): a slightly moldy flavor from improperly stored green beans. Rio(-): harsh medicinal smell. Caused by trichloroanisole produced by excessive fermentation during wet process de-pulping. Sweet(+): smooth balanced flavor with an absence of ‘off ‘ tastes. Winey(-)or(+): flavor resembling the tannic character of wine, usually from fermentation of bean while in fruit. Purchase coffee as soon after it has been roasted as possible. Fresh roasted coffee is essential to a superb cup of coffee. And purchase your coffee in small amounts—only as much as you can use in a given period of time. Ideally you should purchase your coffee fresh every 1-2 weeks. The amount of time that the water is in contact with the coffee grounds is another important factor affecting the taste of your coffee. In a drip system, the contact time should be approximately 5 minutes. If you are making your coffee using a plunger pot, the contact time should be 2-4 minutes. Espresso, as the name implies, means that the brew time is short—the coffee is in contact with the water for only 20-30 seconds. If the taste of your coffee is not optimal, it is possible that you are either overextracting (the brew time is too long) or underextracting (the brew time is too short) your coffee. Experiment with the contact time until you can make a cup of coffee that suits your tastes perfectly. Information on brewing collected from The National Coffee Association USA. 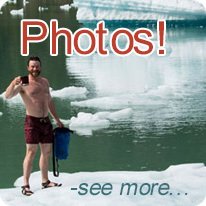 Visit their website at: http://www.ncausa.org/.